WRTC 2002 will be run within the IARU 2002 HF Championship. 3.5 – 7 – 14 – 21 – 28 MHz bands may be used. Both CW and SSB on 3,5 – 7 – 14 – 21 – 28 MHz bands. Mixed mode QSOs are not allowed. Only English language and common international abbreviations can be used – both on SSB and CW. WRTC stations send signal report and ITU zone. (Finland is in ITU Zone 18). A complete exchange must be logged for each valid QSO. The same station can be worked once on CW and once on SSB on each band. All CW QSOs must be made within the CW sub-bands mentioned at item “Frequencies / Bands” of these rules. All SSB QSOs must be made within the SSB sub-bands mentioned at item “Frequencies / Bands” of these rules.Cross-band QSOs are not allowed. Soliciting QSOs in any way before the contest period is not allowed. The contest site must be QRT for the last 10 minutes before the contest start. No one may be on the air from the contest site during this 10 minute period with any callsign.The operators are not allowed to identify, who they personally are or which team they are.Use of non-amateur radio means of communications (e.g. telephone or Internet) for the purpose of soliciting a contact (or contacts) before or during the contest period is not allowed.QSO schedules arranged before the contest period are not allowed. Use of packet cluster or any other spotting methods is not allowed. Correct two-way CW or SSB QSOs with stations located in Europe count 1 point. Correct two-way CW or SSB QSOs with stations located outside Europe count 2 points.QSOs with maritime (or aeronautical) mobile stations count 2 points.A duplicate QSO on same band and mode counts 0 points. DXCC countries and IARU member society HQ stations on each frequency band, once per band regardless of mode. (Note: a HQ station can be a double multiplier, i.e. DXCC-country + IARU member society. )Maritime (or aeronautical) mobile stations do not count as multipliers. For every bad or wrong call verified by a nominated team of referees, a QSO point reduction worth 2 more similar QSOs will occur. (Total penalty per bad or wrong call = 3 x QSO’s point value). WRTC2002 winner: the team with highest score. WRTC2002 first runner-up: the team with second highest score. WRTC2002 second runner-up: the team with third highest score. All decisions of the WRTC2002 Judging Committee are final. Everything else needed is expected to be brought in by each participating team themselves. 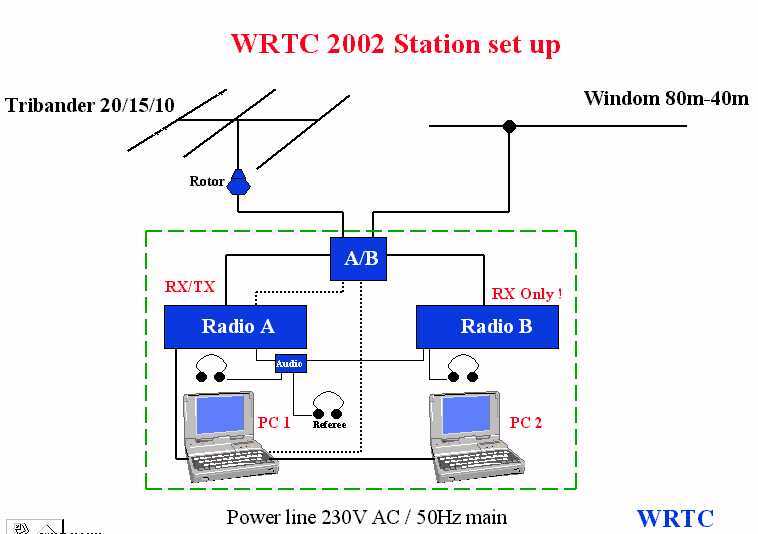 Each WRTC2002 station has two radios (A and B). The radios must be named as radio A and radio B before the contest starts. All QSOs must be made on radio A while radio B can only be used for monitoring and searching. Radio B can be changed to become radio A only in case of malfunction, as determined by the referee. Maximum output power is 100W. Band-pass filters are allowed for both radio A and radio B. The PC’s must be named as PC 1 and PC 2 before the contest starts. Other station automation related equipment is allowed as such, but the final station automation and auxiliary configuration should be presented to the organizer’s Technical Committee by 15-May-2002 for final review and acceptance. Any necessary agreements for temporary importation of radios, PC’s, auxiliary equipment etc. will be made with Finnish Customs by the organizer. Operator A : exclusively controlling the radio A that makes all QSOs. Operator B : monitoring the station logging, propagation and performing the search function. Operator B cannot make any QSOs. Operator B cannot control, drive or use radio A in any way. Operators A and B can change their functions at any time by physically changing from one radio to the other radio. PC 1 can connect only to radio A and other station auxiliary equipment, such as antenna switches and receive-only audio switching. Only radio A can be keyed. Of the two PC’s only PC 1 can key the radio A. Use of different devices for reproduction of voice is allowed, but only at radio A. The teams must provide any such devices and needed interfaces themselves. The audio of operator A must be shared with the referee by a female type of 1/4″ connector and/or Y-connector at radio A. Each team should bring the needed connector for this audio sharing. What Else Can Be Done? PC 1 and PC 2 can be networked for the purpose of sharing log data and for general communication between the operators. Operator A can share the audio of operator B.
Antenna switches and band-pass filters can be operated by PC 1 and/or radio A as well as manually. In case of malfunction, the malfunctioning equipment can be replaced with spare equipment. Operator A cannot touch radio B. Operator B cannot touch radio A. Operator B cannot share the audio of operator A.
PC 2 cannot be conneced to radio A or radio B or antenna switches in any way. PC 2 cannot control PC 1 or radio A in any way. Only operator A can have a microphone and a PC keying function. Auxiliary equipment such as PC’s, microphone, CW and voice keyers cannot be connected in any way to radio B. No other antennas than the two antennas provided by the contest organizer can be used. No other software than the logging software can be used.